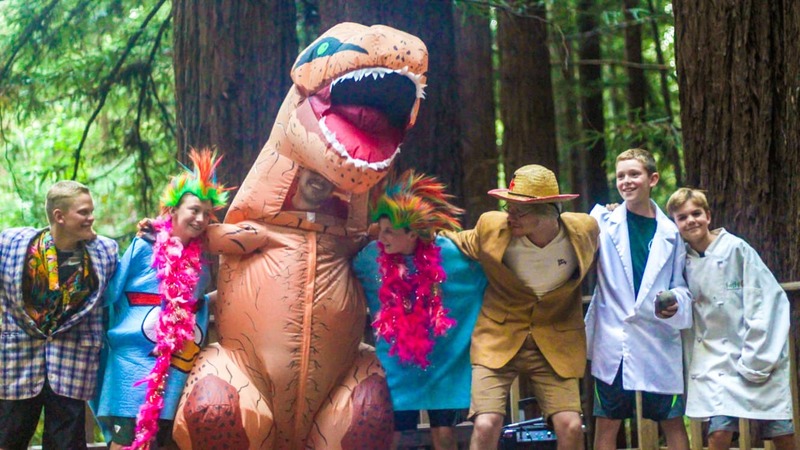 Each Friday we plan a fun themed activity day, when campers and counselors alike can dress up and participate in special activities related to the theme. 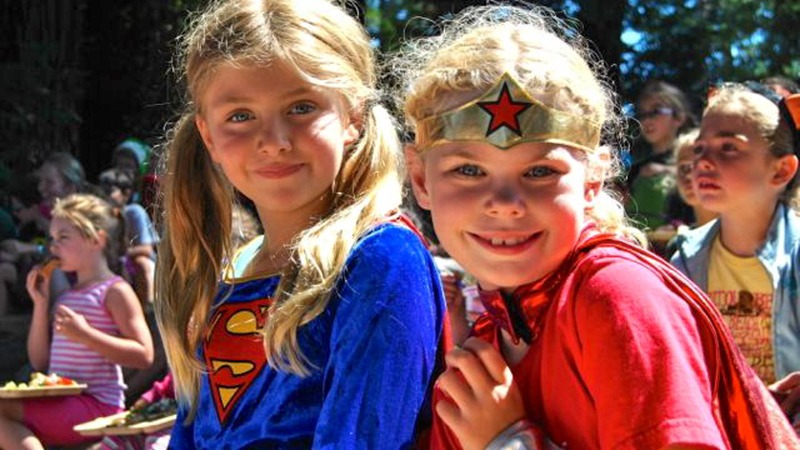 All week long we feature skits, songs, sudden performances and activities to build excitement around the theme, which might be Rock Star Day, Super Hero Day, Olympic Day, Luau Day…and more! Each Friday morning, campers entering second grade or higher have free choice time when they may select new activities (or favorites they can’t get enough of!). Younger campers stay with their groups to enjoy favorite activities. After lunch, we start our theme-based activities! On Luau Day, we build sandcastles at our Volleyball Court. On Rock Star Day, each group prepares to have their own rock show. 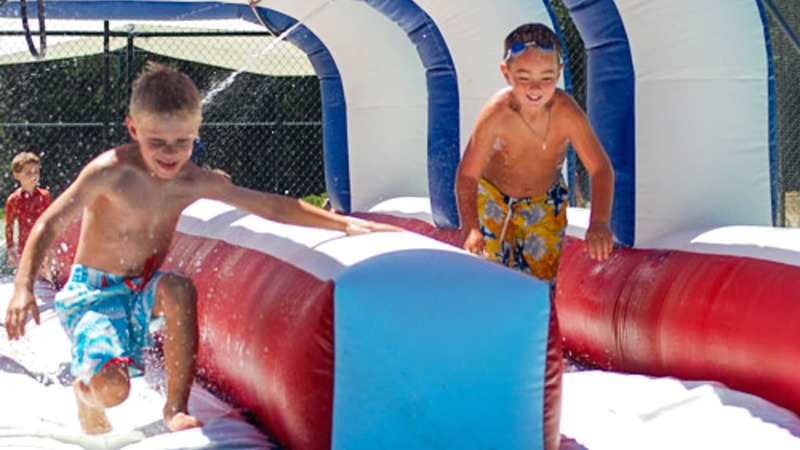 We plan all sorts of fun and unexpected things, and have been know to build rafts for the pool, put a favorite counselor in the dunk tank, or set up our 30 foot inflatable slip n’ slide! At closing circle, we plan an extra-special farewell for our campers before they board the buses home. Friday Fundays end at 3 pm and are the perfect way to round up an exciting week at camp. Each Day we gather together to start and finish the day. Kennolyn has a rich tradition of music and singing. Campers learn a wide range of camp songs which they will share with you at home. Another great tradition of these gatherings are the Bus Cheers. All of our bus counselors will work with the campers on their bus to come up with a daily cheer. This is a highlight for many campers as they try to cheer louder and funnier than the other buses. If we have a camper with a birthday, they get to come on stage with the day camp staff. The lucky camper will get to choose the song they will sing together. It is a fun birthday tradition that campers look forward to.